For anyone who needs to be told, this is a red letter day for music video creativity, simply because Jean-Baptiste Mondino is a bona fide legend of the medium. The man who directed Madonna in Open Your Heart and Justify My Love, Bryan Ferry's Slave To Love, Don Henley's multi-MTV VMA-winner The Boys Of Summer. This was back in the Eighties, and his work from that time – so good, so influential on so many other great directors - looks like it was made at any point between then and now. It's absolutely timeless. And now... he's back, with a brilliantly simple idea, beautifully executed, for Lenny Kravitz's best song in several decades. 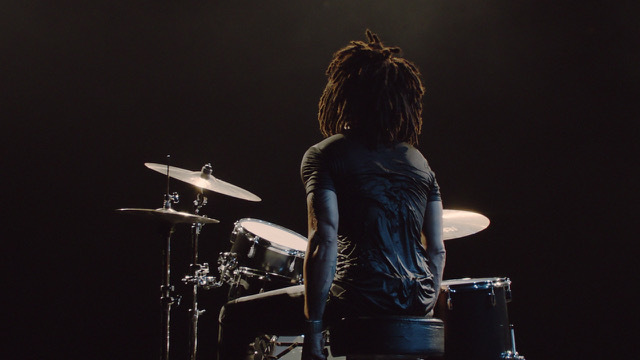 Lenny is alone, on the drums under a spotlight, hitting the skins and singing: pumped-up, dripping with sweat, never stopping. Mondino's camera revolves around Kravitz, getting ever tighter - and then reveals a doppeganger: The girl with even better hair than Lenny, dressed the same as Lenny, duelling on drums with Lenny, and delivering the chorus of Low to Lenny's lead vocal. It's simple, but the intense focus on the performance, and the song, never wavers - it just gets tighter and stronger all the time. Brilliant.